It could be argued, without raising too much of a sweat, that Koko Taylor was the greatest female blues singer of all time. The undisputed Queen of Chicago Blues, Taylor was a big-voiced blues shouter in the vein of Big Mama Thornton. She was an even bigger presence on the modern blues scene, staying active nearly until her death in mid-2009. Taylor won more W.C. Handy/Blues Music Awards than any other female artist, and she continued to light up stages and knock out appreciate audiences, remaining vital and electric until the final days of her lengthy career. Although much of Taylor's better-known and award-winning material was released by Alligator Records, who signed the singer in 1975 after the demise of Chess Records, Taylor's larger-than-life reputation was earned for the dozens of songs and handful of albums that she recorded for Chess over the course of the previous decade. Taylor started her career with Chess in 1964, and hit the big time a year later when she took the Willie Dixon-penned classic "Wang Dang Doodle" to #4 on the R&B charts, eventually selling over a million copies of what would become her signature song. The hit single would open doors for Taylor, who saw demand for her dynamic live performances skyrocket. Taylor's What It Takes - The Chess Years originally appeared on CD in 1991 as an eighteen-song compilation of the singer's best work for the label, including several previously unreleased (at the time) songs. Reissued in 2009 as an exhaustive twenty-four-track history of Taylor's eight years with the label, this limited edition version adds six rare "bonus tracks" to fulfill every Koko Taylor fan's desire. Without discounting the talents of the musicians assembled behind her, this is Koko's story, and nobody could grab a song and spark life into it like Taylor. "I Got What It Takes," from which this collection takes its name, was Taylor's first Chess single. A bruising, slow-rolling blues shouter, it announced Taylor's arrival on the Chicago blues scene with little subtlety, powerful vocals, tasteful Buddy Guy fretwork, and Big Walter's mesmerizing harp tones. "Don't Mess With The Messer," which landed in 1965, is more of a R&B styled dance number with nimble rhythms, but Taylor's fine vocals are nearly lost in the mix. Dixon's "Wang Dang Doodle" was Taylor's first smash hit for Chess, and sounds just as forceful today as it did in '65. This is one of the greatest Chicago blues songs ever, with Dixon sharing vocals, great guitar interplay between Guy and Johnny "Twist" Williams, and blastin' saxes to clean out any leftover wax from your ears. The soulful "(I Got) All You Need," from the same session, is an R&B rave-up that shows a more playful side of Taylor's voice without sacrificing any strength or bluster. The menacing "Insane Asylum" is one of the best duets between Dixon and Taylor, with stomping, screaming vox laid atop Lafayette Leake's imaginative pianowork. The spry, up-tempo "Fire" is a fast-paced bluesy rocker with raucous vocals, mid-1960s period saxplay courtesy of Gene Barge, and a rollicking soundtrack with robust rhythms from an unknown bassist and drummer. A live recording dating from 1972 has the great Muddy Waters joining Taylor onstage for an electrifying performance of "I Got What It Takes," the two charismatic singers swapping verses, both turning in smoldering performances. The six additional "bonus tracks," comprised largely of forgotten singles and B-sides, do a great job of fleshing out an already impressive set. Taylor's original "What Kind Of Man Is That?" shows some songwriting skills, but it's her vocal performance - sultry and growling at the same time - that knocks the song out of the ballpark. Throw in Horton's wailing harp and downplayed guitarwork by Guy and Robert Nighthawk, and it’s a wonder that this one wasn't a hit. A cover of J.B. Lenoir's "Good Advice," with well-timed horns framing the vocals, and a shuffling beat, sounds like the best R&B music you've ever heard coming out of your car radio while "Tease Your Man," from 1971, is an underrated gem. A great performance that stands where blues and soul music intersect, Taylor has great control over her vocals, which range from a quiet storm to a raging hurricane. Louis Satterfield's fat bass lines drive the rhythm, while Joe Young and Dennis Miller swap some jazzy guitar licks. 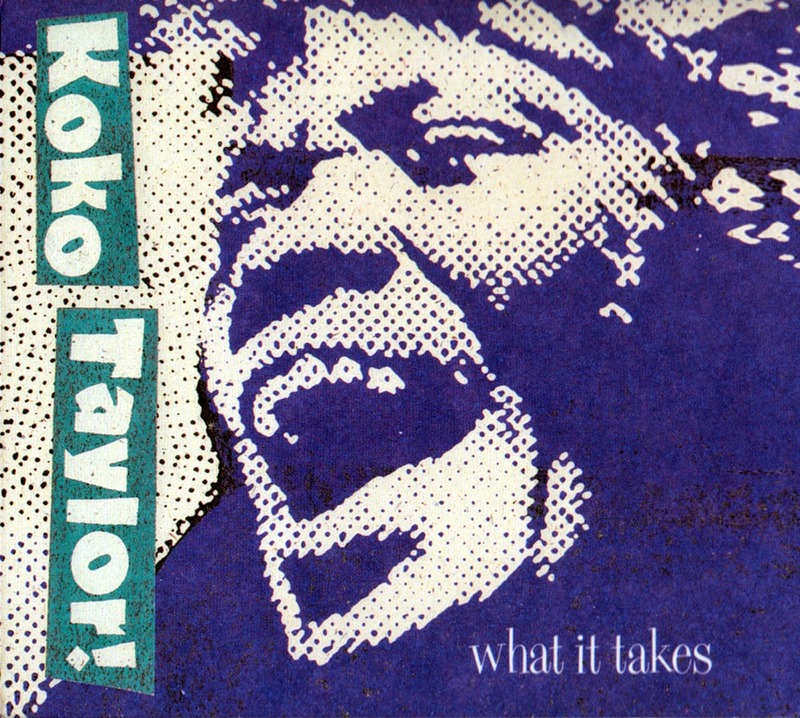 Koko Taylor was a one of a kind, old-school blueswoman who infused every performance with style, emotion, and power, and it's safe to say that there won't be another one like her to come along anytime soon. What It Takes - The Chess Years should be a required addition to every blues fan's listening library, representing not only some of Taylor's best work, but the sound of Chicago blues during the often-overlooked era of the 1960s. More than a mere collection of two-dozen ear-pleasing songs, this is also Taylor's musical legacy.